Welcome to our February newsletter. Brrrrrr it’s cold outside, but the studios are toasty and we have lots of events for you to choose from in our busy month ahead. We are excited to welcome Cheree Low. She is an Iyengar teacher from East Dorset who I hope will be offering us some regular Iyengar yoga workshops. 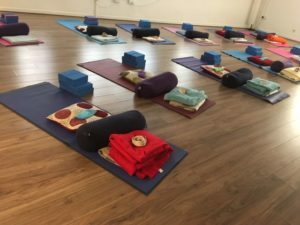 And a new course from one of our newer and very experienced teachers, Toni Roberts: Yoga Therapy for the Mind. You can talk to Toni confidentially to find out if this course may be able to help you to achieve a positive mental well-being. Body Dialogue with Trilby Fairfax; a chance to really go inside and listen and explore your body in a unique way. Lots there for the family!